Adding helicopters to your trailers is always a good idea. Medal of Honor is an upcoming first-person shooter video game in the Medal of Honor series, developed by EA Los Angeles and DICE, due for release on Microsoft Windows, PlayStation 3 and Xbox 360 in October 2010. The game will be a reboot of the series, set in modern-day Afghanistan. 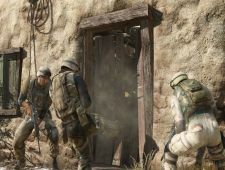 Medal of Honor's single-player campaign will use a heavily-modified version of Unreal Engine 3 and its multiplayer will use the Frostbite engine. This game is expected to utilize dedicated servers as hinted by Sean Decker, General Manager at EA, in Atomic PC's feature article.